20th October would not be a day in the year you would normally equate with brilliant blue sky and a temperature in the 20’s, however, as the members of the South London Fellowship Band descended on Hove Corps, it made for a very pleasant journey. 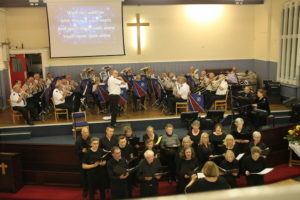 Mention had been made that the Band was the first visiting section for at least 10 years, which made it even more of a pleasure to support the Corps in this joint concert with the Hove Community Choir. The Band were greeted by the Corps Officers Doug & Michelle Hayter – instruments and uniforms were dropped by the hall and by the time we came back from parking our cars in an Industrial Unit, everything had been taken inside. Hove is an old-style hall with a downstairs seating up to a hundred and a similar size balcony, with a myriad of ante-rooms on three different levels. The Band set up for a sound check, which included playing ‘How Sweet the Name’ (French) which would be used in the concert. A rehearsal ensued with the Hove Community Choir for the joint item which was to end the evening – ‘You’ll Never Walk Alone’. Rehearsal complete, there was a short break before the Buffet Tea – a splendid spread, which quickly disappeared – with the Band, Choir and Supporters enjoying the food and an Army Cup of Tea or Coffee. It was good to enjoy fellowship with each other and also welcome three ‘Deps’ for the evening, Lee, Barry & Wills. The programme started with what is often regarded as the best Salvation Army march ever, ‘Celebration’ by the peerless Leslie Condon. It was immediately followed by the beautiful Len Ballantyne Arrangement – Mid All the Traffic – which uses the tune Shenandoah, which then led in to the opening prayer. The Corps Officers then welcomed the Band, Choir and congregation reminding them that as entry was free, they wouldn’t be allowed to leave without donations to the Army’s Community Work! Later in the evening when the collection was taken it was heartening to see the plethora of notes. The band then led the congregation in the singing the recent, more upbeat version of ‘Praise My Soul the King of Heaven’. So to the programme; which was kicked off with ‘Call of the Gospel’ by Martin Cordner, a favourite of the band, which produced a stirring rendition. The words of the featured chorus – ‘We have a Gospel that matches the hour, We have discovered the true source of power…..’ resonate with me personally about the mission of the band. 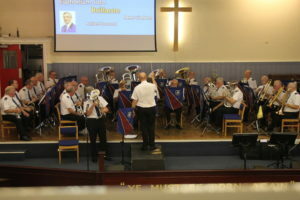 The next item was the first of the band’s soloists – Maurice Horwood (trombone) playing Blessed Assurance. A modern arrangement with a bluesy/jazz feel to it and, as ever, played well by Maurice. It’s always good to hear Community Choirs which are often led and hosted by Corps. The Hove Community Choir is made up of local people who enjoy the benefits of meeting and singing together. 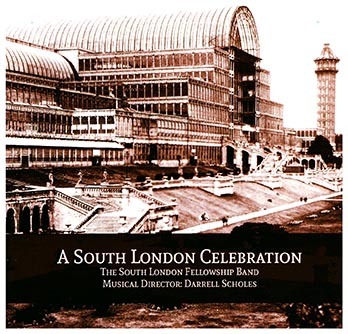 Their repertoire for this concert was songs from the stage and screen, under the leadership of Margaret Peacock and with Major Marian Parker as accompanist. They sang two numbers, ‘Raindrops Keep Falling on my head’ and the classic from Morecambe & Wise ‘Bring me Sunshine’. Brian Hillyer, the Band Librarian, certainly enjoyed it by putting his hands behind his head just as Morecambe & Wise used to do at the end of their TV shows! The joy of music and singing was certainly evident. The band’s second soloist of the evening, Craig Finch (flugel horn), then played ‘Morricone’s Melody’ – more commonly known as Gabriel’s Oboe – a sensitive rendition of a great piece of music. Continuing the theme of music from stage and screen, the band played ‘Alone yet not alone’- a staple component of the band’s repertoire this year, it unusually features the baritone played for us by John Clark who, as ever played the opening with great skill. The final number of the first half was ‘Happy’ a brass band arrangement of the Pharrell Williams song of the same name, written for the movie ‘Despicable Me 2’. Not your usual number from a band associated with The Salvation Army, but it seemed to receive the loudest applause – as it did when the Band used it in William Booth Training College a few weeks earlier. oning behind the choice of melodies used. This is always useful for musicians in understand how a composition came about. The band’s third and final soloist, Adrian Horwood (euphonium) then played the technically demanding ‘Brillante’, based on Rule Britannia and as always Adrian gave a flawless performance. It was the Community Choir’s turn next and we were treated to two songs from Abba. ‘Money, Money, Money’ and ‘Super Trouper’. The latter was the most demanding and was extremely well sung. Mention was made that it was some 44 years ago (1974) that Abba won the Eurovision Song Contest down the road in the Brighton Dome. The leader, choir, pianist and backing group should be congratulated for their performance. The band then quietened the tone for the final part of the evening by playing ‘How Sweet the Name’ (French). This was played for Band Member Roy Payne who was in the congregation following a serious illness. This was his favourite arrangement and I am sure it provided great comfort for him. The scripture reading and thought was then provided by Bev Hudson, reminding us that we should not walk around with ‘Do Not Disturb’ signs. The Christian message is an active one and for the Gospel to be spread we need God’s presence in and through us. This led to the band’s final item ‘In God’s Presence’, a lovely arrangement by Andrew Blyth featuring the song ‘Bow the knee’. And so to the finale. The choir and band joined together for “You’ll Never Walk Alone” from the 1945 Rodgers & Hammerstein musical Carousel…. and I am sure this went down a treat with any Liverpool fans present. It started with the choir, band and audience singing until the band added to the accompaniment for the rousing ending. So ended a great evening of music and song. Designed by Web Design Tunbridge Wells.